Ben Bernanke just started his own blog at the Brookings Institute. His first post, from today, Inaugurating a New Blog is the announcement. Let's dive into Bernanke's second post of the day: Why are Interest Rates So Low? Bernanke: Low interest rates are not a short-term aberration, but part of a long-term trend. As the figure below shows, ten-year government bond yields in the United States were relatively low in the 1960s, rose to a peak above 15 percent in 1981, and have been declining ever since. That pattern is partly explained by the rise and fall of inflation, also shown in the figure. Mish: Inflation is only low if one ignores asset bubbles. The CPI does not factor in bubbles induced by monetary policy. The Bernanake and Greenspan Fed ignored the biggest bubble ever in housing for which the Fed has never apologized nor admitted any wrong doing. 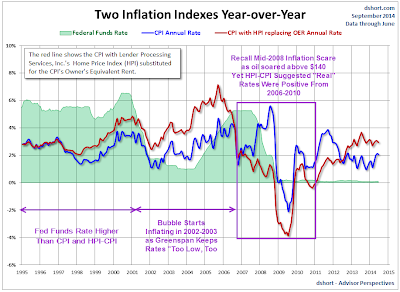 The effects of inflation are visible everywhere, except of course where the Fed looks. Bernanke: If you asked the person in the street, “Why are interest rates so low?”, he or she would likely answer that the Fed is keeping them low. That’s true only in a very narrow sense. But what matters most for the economy is the real, or inflation-adjusted, interest rate (the market, or nominal, interest rate minus the inflation rate). The real interest rate is most relevant for capital investment decisions, for example. The Fed’s ability to affect real rates of return, especially longer-term real rates, is transitory and limited. Except in the short run, real interest rates are determined by a wide range of economic factors, including prospects for economic growth—not by the Fed. Mish: It is difficult to say precisely where interest rates would be in the absence of the Fed, but the answer is likely, surprisingly low. The reason is the Fed (central banks in general) coupled with government deficit spending and fractional reserve lending are the very source of inflation. Amusingly, the Fed bills itself as an "inflation fighting force" but it is a key determinant of inflation. 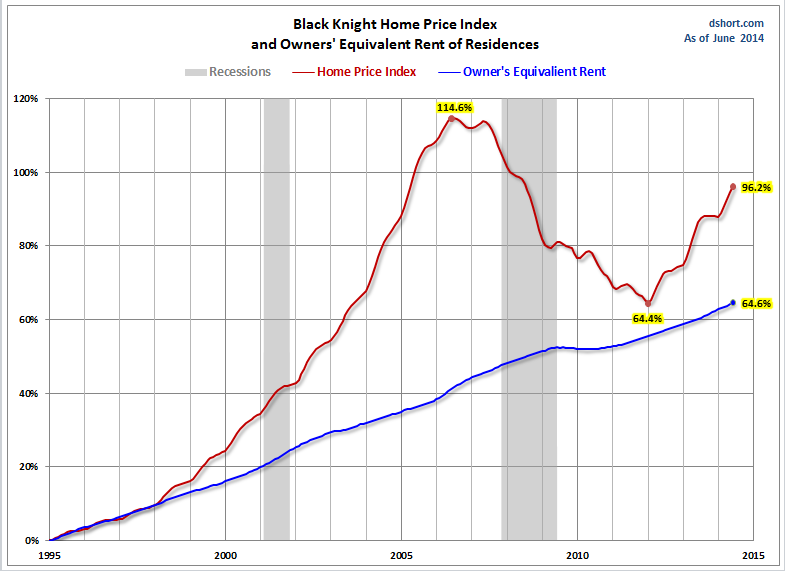 Worse yet, and since the Fed is totally clueless about asset bubbles, it fails to see inflation in front of its nose. Bernanke: To understand why [the Fed’s ability to affect real rates is transitory and limited], it helps to introduce the concept of the equilibrium real interest rate (sometimes called the Wicksellian interest rate, after the late-nineteenth- and early twentieth-century Swedish economist Knut Wicksell). The equilibrium interest rate is the real interest rate consistent with full employment of labor and capital resources, perhaps after some period of adjustment. Many factors affect the equilibrium rate, which can and does change over time. If the Fed wants to see full employment of capital and labor resources (which, of course, it does), then its task amounts to using its influence over market interest rates to push those rates toward levels consistent with the equilibrium rate, or—more realistically—its best estimate of the equilibrium rate, which is not directly observable. Mish: With that, the Fed admitted it is clueless about the alleged "equilibrium rate". Indeed it is not observable, nor is the concept of full employment known or observable. Government interference in the free markets, especially minimum wage laws grossly distort the level of full employment. Factor in changing consumer preferences and demographics, and it's a fool's mission to believe the Fed (any central bank), can come up with a realistic estimate to something Bernanke correctly admits is not directly observable. Bernanke: When I was chairman, more than one legislator accused me and my colleagues on the Fed’s policy-setting Federal Open Market Committee of “throwing seniors under the bus” (to use the words of one senator) by keeping interest rates low. The legislators were concerned about retirees living off their savings and able to obtain only very low rates of return on those savings. I was concerned about those seniors as well. But if the goal was for retirees to enjoy sustainably higher real returns, then the Fed’s raising interest rates prematurely would have been exactly the wrong thing to do. Mish: It's not the interest rate policy directly that threw seniors under the bus. Rather, it's the Fed's inflation policy while ignoring the consequences of asset bubbles that threw everyone but those with first access to money under the bus. The Fed ignored an enormous housing bubble (Bernanke did not see it at all), then when housing crashed, the Fed lowered rates to save the banks. The overall action was as "necessary" as it was to have a Fed sponsored housing bubble in the first place. Bernanke: A similarly confused criticism often heard is that the Fed is somehow distorting financial markets and investment decisions by keeping interest rates “artificially low.” Contrary to what sometimes seems to be alleged, the Fed cannot somehow withdraw and leave interest rates to be determined by “the markets.” The Fed’s actions determine the money supply and thus short-term interest rates; it has no choice but to set the short-term interest rate somewhere. Mish: Bernanke's comment is preposterous. There was not always a Fed. And the market once set interest rates on its own accord. Moreover, there does not need to be a Fed any more than we need government central planners to determine steel production or the price of orange juice. The Fed certainly does have a choice. Bernanke: So where should that be? The best strategy for the Fed I can think of is to set rates at a level consistent with the healthy operation of the economy over the medium term, that is, at the (today, low) equilibrium rate. There is absolutely nothing artificial about that! Mish: It's as artificial as the Fed determining how much steel the mills should produce! In other words it's totally artificial. Besides, Bernanke even admitted the Fed does not know what the equilibrium rate is, and it ignores asset bubble when attempting to land on the unknowable and unobservable. Is it any wonder the Fed has blown asset bubble after asset bubble with increasing amplitude over time? I have made several posts on the consequences of ignoring asset prices while attempting to measure "inflation. 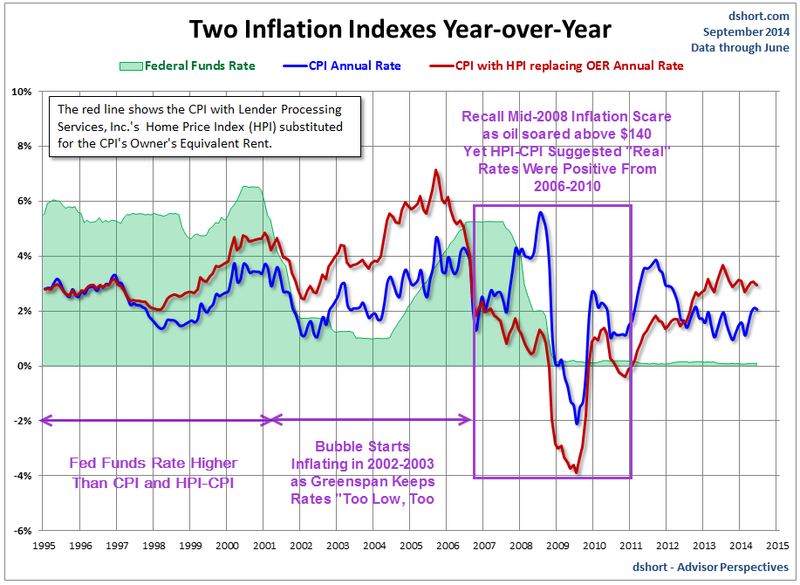 Here are two charts from my September 2014 post Housing Prices, "Real" Interest Rates, and the "Real" CPI. In the following charts and commentary, I substitute actual home prices as measured by the Home Price Index (HPI), for Owners' Equivalent Rent (OER), in the CPI. In mid-2008 when everyone was concerned about "inflation" because oil prices had soared over $140, I suggested record low interest rates across the entire yield curve. At that time the CPI was close to 6% but the HPI-CPI was close to 0% (and plunging fast). I would specifically like to see Ben Bernanke comment on those charts and how and why he thinks asset bubbles can be excluded from measures of inflation.